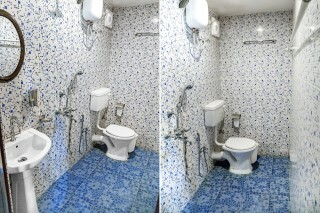 This is an offering of a single bedroom in a guest house, located at a distance of 1.5 km from Mae De Deus Church. St Alex Church is at a distance of 3.6 km and Cross at The Holy Trinity Church at 2.5 km from the property. 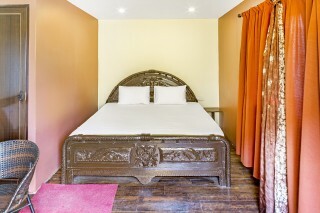 The bedroom on offer can accommodate up to three people. 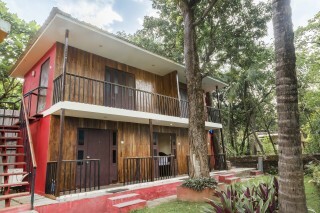 The property is conveniently located with numerous eateries in close proximity. 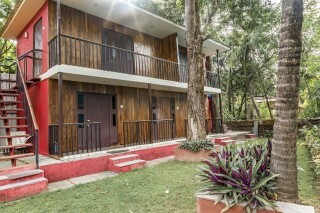 The property is dotted with tropical plantation and tall palm trees. 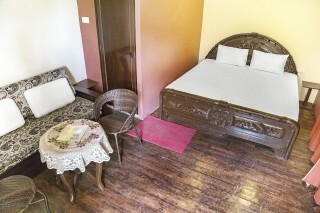 The air-conditioned bedroom on offer is comfortably furnished with a plush double bed, cane chairs, coffee table, two-seater sofa, and a room fan for added convenience. A mini fridge and a microwave are also available for use. 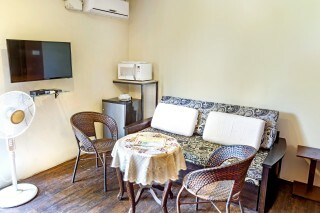 A wall-mounted LCD TV ensures that you can watch your favourite shows, even while on a vacation. The en suite bathroom is well appointed with modern sanitary ware. The ample windows ensure sufficient daylight and adequate ventilation. The services of a chef are available on request at a cost of Rs.700 per meal Pick up and drop at extra charge Shared Kitchen Guests are requested to provide valid identification at the time of check-in. "Located close to popular beaches, sightseeing spots in proximity"
This room was even cuter in real life. I booked this accommodation for my mini-vacation with my wife. This place was great value for money, such a bargain! The furniture and the interiors were so old school and had a story to tell. This place was just oozing charm. And I know it might seem like a big deal but having a microwave in out room was really helpful. As far as the people working there, the services were just excellent. We were able to easy navigate to place just because of the wonderful staff. They served us well and took great care of all our needs. Now I would like to talk about the highlight of this vacation- THE LOCATION. It was just lovely to get away from the noisy city and find a peaceful environment to spend a couple of days in. 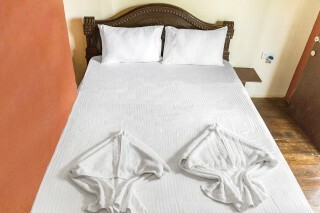 The calm and the refreshing surrounding enhanced our overall experience. Apart from that we also really loved visiting a couple of churches and beaches. Pleasant room ! Location wasn't near to shops or beach ! But friendly helping area ! In village so nothing to find near by ! Calm quiet ! 3 out of 5 ! Amazing Room And View. Clean And Kept well. We Didn't Feel Like leaving . thank you for the amazing stay. hope to visit again next time.